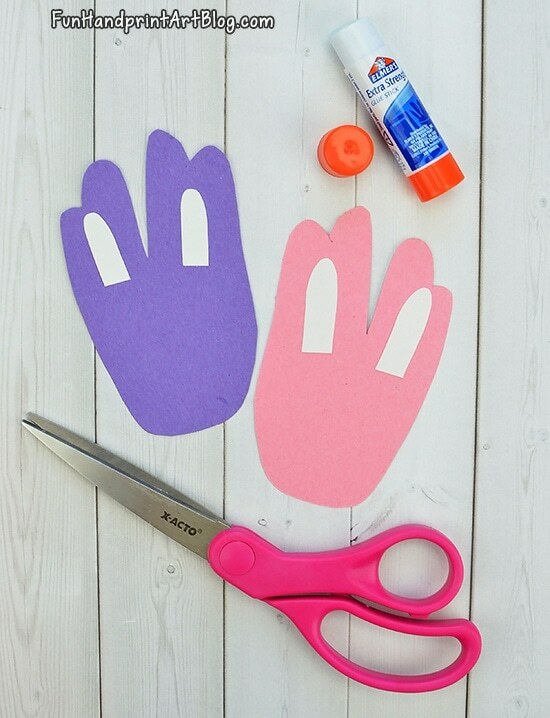 There’s only so many ways to make an Easter bunny handprint craft, so here’s a cute spin on it. A bunny in a basket! 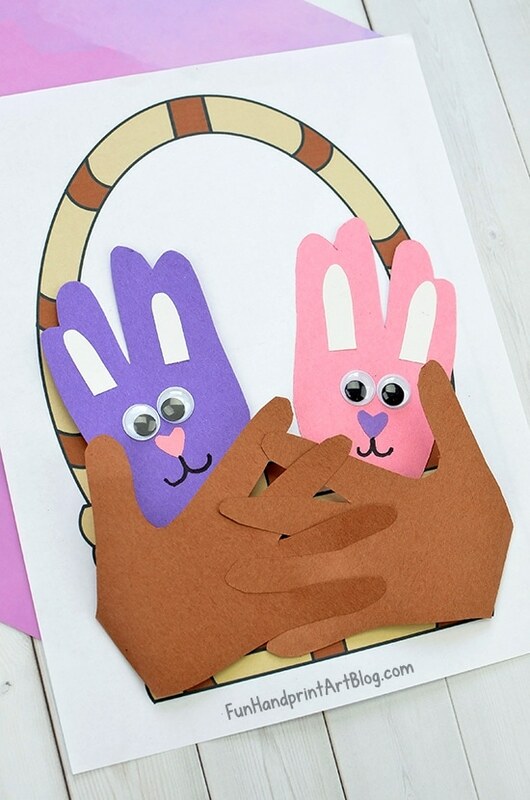 Two traced hands with the fingers weaved together create a 3D Easter basket that’s nice and cozy for your little handprint bunny friends. 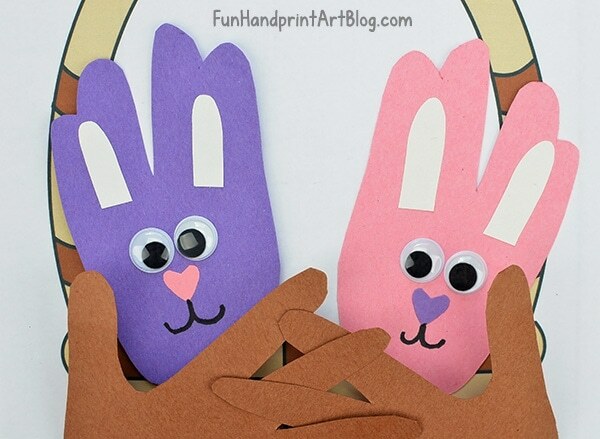 This is a great, no paint mess, Easter bunny craft for preschoolers. Kids can make it as an Easter keepsake or card for their parents or grandparents. Another idea is to get the whole family involved. 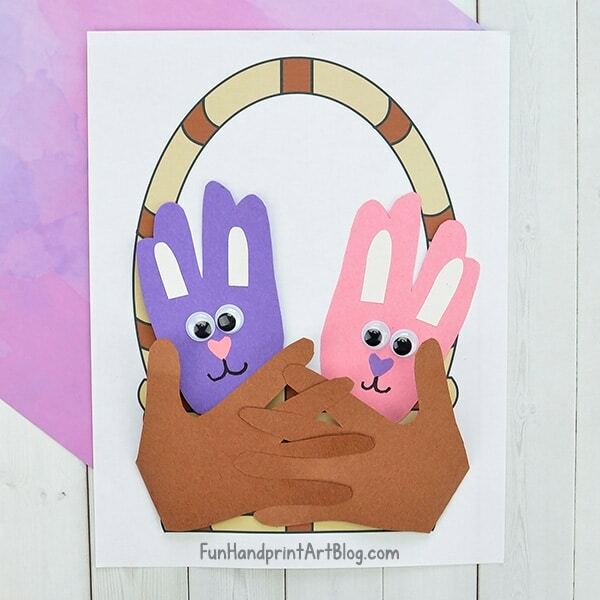 Fill the Easter basket print out with hand shaped bunnies from everyone! The first step is to trace one hand on pink paper and the other on purple paper. To make a bunny shape, omit the thumb and split the fingers two on each side. Next, cut a little piece of white paper into long “U” shape for the inside of the bunny’s ears. Now cut out two small hearts to use as the nose, use a purple nose on the pink bunny and a pink nose on the purple bunny. If you are making this Easter bunny craft for preschoolers, you can always have these small ear and nose pieces pre-cut or use heart stickers. 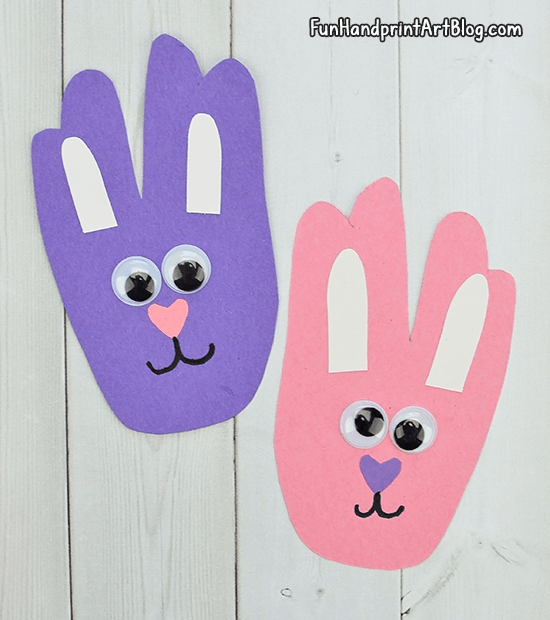 To make the handprint Easter bunnies come to life, draw on a cute smile and stick on the google eyes. The Easter bunny handprint craft is almost done, don’t forget the bunnies need a cozy basket bed. Start by printing the PDF template, decide if you want to color the basket or print it already in color. 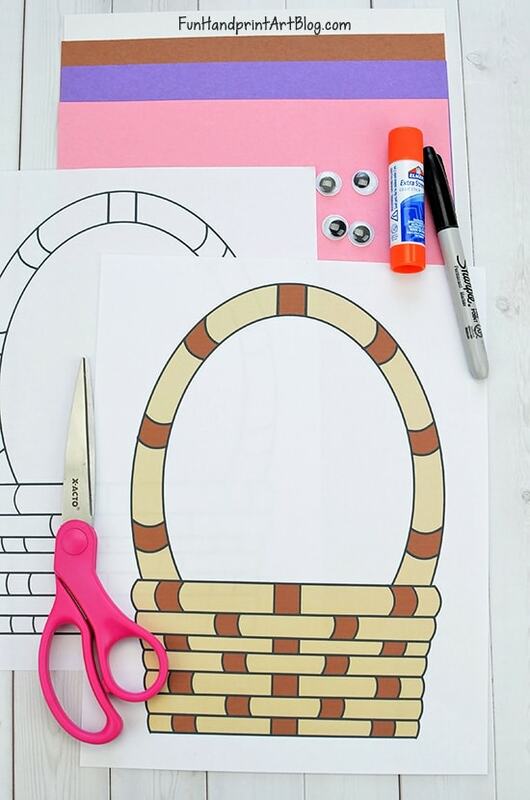 If this is an Easter Bunny craft for preschoolers, then it might be good to print the black and white template, so the kids are busy coloring while you cut out the handprints. Now, trace both hands and a little part of their wrist on brown paper. 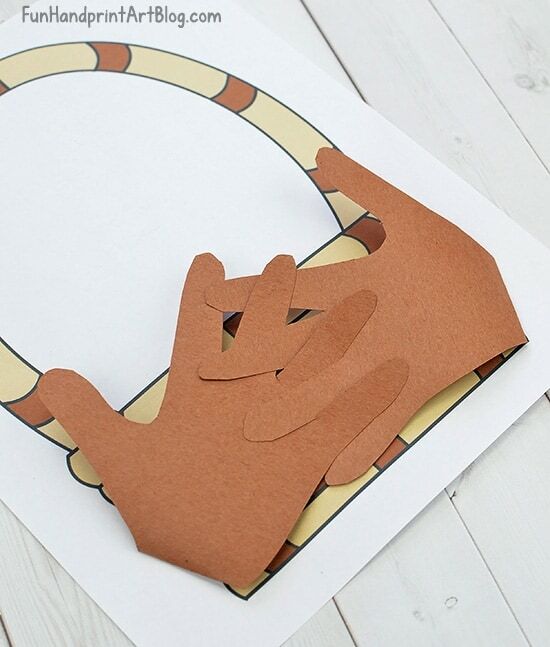 Next, cut the handprints out and fold under the wrist. Place the two handprints on the basket with the fingers pointed inward. To create a basket effect, weave the fingers together. Now you can put some glue on this folded wrist part and secure it to the edge of the basket. 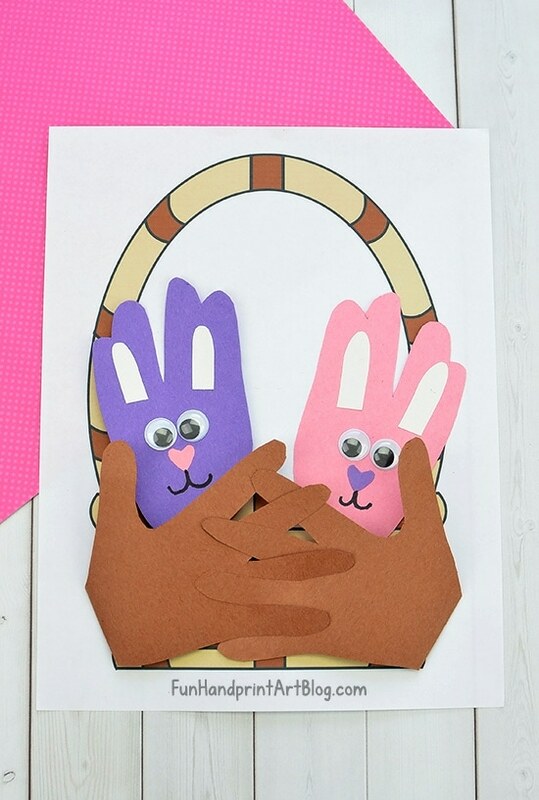 Sneak some glue on the two pinkie fingers and secure to the template so the bunnies can fall out of the basket. Lastly, place the bunnies in the basket or glue them to the template. The Easter bunny handprint craft for preschoolers is complete! 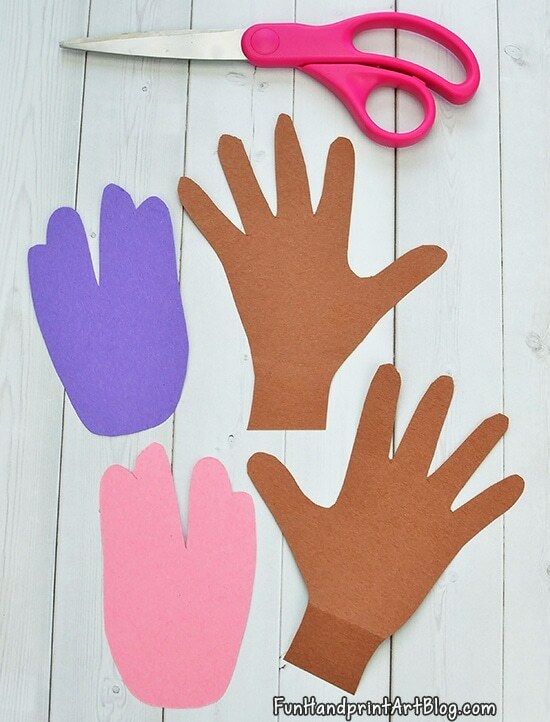 See more ways to make a bunny from footprints and handprints!